Going back to my hometown roots today. I may live in Colorado, but I will always be an Ohio girl. I am pretty sure I could never live there again (nope, positive), but it’s where I spent a big chunk of my life and where all of my extended family still lives. So, it will always be apart of me… and I like that. Plus, it’s where I learned all about buckeyes! I don’t know what about Ohio made me think of this random thought, maybe all the farms… and green, but someday I hope to live on a farm. A big farm in the middle of nowhere. Yup, that’s my dream. The simple life, nothin fancy, pick up trucks, tall boots(!! ), rows of vegetables, cows all over and trees for miles. Preferably I would love this farm to be in the mountains somewhere, because I really do love the mountains and even when I leave them for a few days I am always excited to see them again upon return. The problem is that farming is not all that conducive as high up as we are. That’s not stopping me from trying to talk my dad into becoming a full on farmer though (wish me luck). We have the land, we have the chickens (who are going to be laying eggs any day now! ), we just need a new barn (no – not the one we are renovating for me to move into – a new one) and um, lot’s of animals. Oh, and definitely some warmer temps so all my veggies and herbs do not freeze. That’ll be a tricky one. Ahh well, a girl can dream. Greenhouses are cool too! So anyway, Sunday I was really feeling like buckeyes. 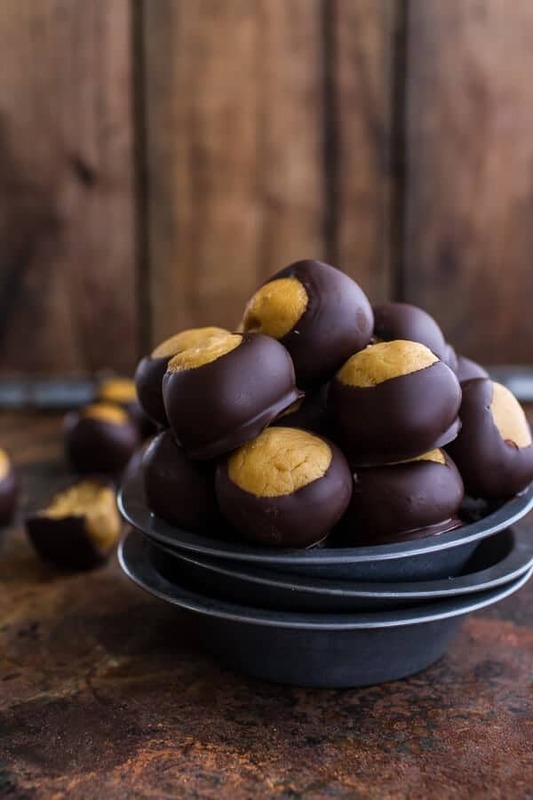 The Browns had just won their first game of the season and it was just time to celebrate… err more like it had been too long since I last made buckeyes and everybody in the house was just craving them. 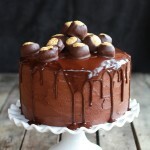 Last year I made this Buckeye Cake that I will remember forever and ever. It’s so flipping good and not to mention a total show stopper. 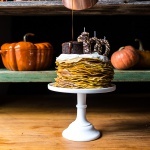 If you want to impress, make this cake. People kind of go “WOW” when they see it. This year though, I am just feeling a little simpler. It’s this new phrase I have repeating in my head “everything should be simple”. Or well, at least that is what I sometimes have going on my head. It really just depends on the day or even the hour. Truth is, I am all over the place. One hour I am all about simplifying and the next, I’m making something with five different parts. Crazy? Yes, that would be me for sure. Whenever I make buckeyes, I never actually use a lot of powdered sugar. I have always made them on the healthier side, but then I wondered if I could make them even healthier and possibly include some of my favorite seasonal ingredients. So I tried and believe it or not, my first attempt worked perfectly. So good and not even the pickiest brother knew there was anything different about these buckeyes. They asked though, because they know me. You see they were surprised I was making something so normal, but I fibbed and told them there was nothing very different about these buckeyes. They ate um, loved um, and now they’re all gone. FYI, the brother test is the test is like feeding a lie detector, it never fails! I am a little scared to tell you what I made these with, but just be open to them. I promise they taste just like any other sugar laden buckeye. These Healthy Harvest Buckeyes (harvest for the healthy ingredients loaded into these buckeyes) are a combo of beans, applesauce, pumpkin, vanilla, salt and peanut butter. I know, sounds so gross, but I promise you’ll taste zero pumpkin and zero applesauce. The beans just add a creamy texture, no taste at all. DO NOT BE FREAKED. Remember, the brother test never fails. And then of course, lots of chocolate. See what I mean when I say healthy? Seriously, these have like a zero guilt factor and it’s pretty amazing how good they are. Plus, they are no bake, no fuss, vegan and gluten-free too! Whoa – I do not even know who I am today. These Healthy Harvest Buckeyes (harvest for the healthy ingredients loaded into these buckeyes) are a combo of beans, applesauce, pumpkin, vanilla, salt and peanut butter. I know, sounds so gross, but I promise you'll taste zero pumpkin and zero applesauce. The beans just add a creamy texture, no taste at all. DO NOT BE FREAKED. In the bowl of a food processor, add the cannellini beans and puree until mostly smooth. Add the applesauce, pumpkin, coconut oil and vanilla. Puree until completely smooth and creamy, about 2 minutes, scrapping down the sides if needed. Add the peanut butter and salt, process another minute. Scoop 1/2 tablespoon size amounts of dough out and roll into a rough ball. Place on the prepared cookie sheet. Repeat with the remaining dough, cover the pans and place in the fridge for 15 minutes. After 15 minutes, remove the balls from the fridge and roll them once more between your hands to smooth the balls out. Stick a toothpick into the top of each ball. Cover the cookie sheets and place them in the freezer for at least 45 minutes, but not too much longer than an hour. Just before removing the balls from the freezer melt the chocolate over a double broiler or in the microwave. 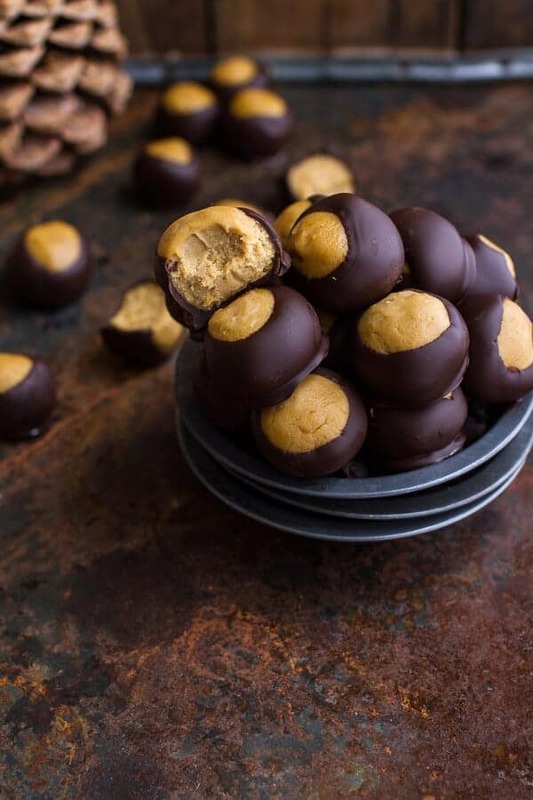 Working with one ball at a time, dip the frozen balls into the chocolate leaving a small opening at the top so the peanut butter can peak out. Place the balls back on the cookie sheet. Repeat with the remaining balls. Store in the fridge until ready to eat. These are best straight out of the fridge with some cold milk! *I used an organic brand of pumpkin that is very thick and not pourable at all. This helped my dough firm up. If you are using a canned pumpkin that is pourable, you may need to add 1/4 cup to 1/2 cup of white whole wheat or regular flour to help the dough firm up. You will not taste they flour at all. Tomorrow though, there is probably going to be a lot of cheese. Just a fair warning. I had never heard of Buckeyes, as it is not a communicatie thing in the Netherlands, but I must say I really like your recipe! And they are a healthy snack as well! Oh I hope you try them then!! Thanks so much! 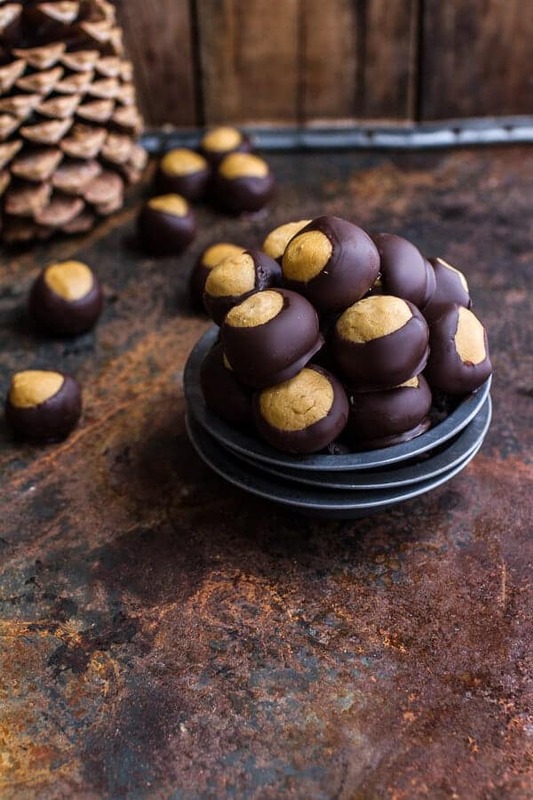 I love buckeyes and I can’t believe how healthy you were able to make them. The original recipe calls for a boat load of sugar and for you to make them look exactly the same without all that sugar is pure genius. Have to try them..the texture looks exactly the same and as you say if it passed the brother test were good. The texture is spot on. I could not believe how good the turn out! Wow!!! This is a genius way to make these healthy. Love it!!! I can see that the peanut butter would rule the taste and no one would ever know. The peanut butter truly does rule the taste, it is incredible! Thanks Charlotte! woah! 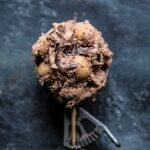 healthy buckeyes made with all these yummy healthy ingredients…. mind blown and totally sold! 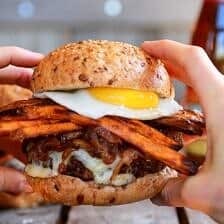 another genius recipe! Thanks so much very much, Holly! Loving these! Can’t wait to try them! I’ve been making buckets since I was in high school but I need to watch what I eat so I would go to Grater’s ice cream and buy three. Now I can make them at home again—-THANK YOU. I had to laugh at “the brother test”. I think the “husband test” is the exact same! Never fails. Can you believe that I haven’t ever had a buckeye? BUT I do like my healthy treats, so these look like they WIN! Pinned! 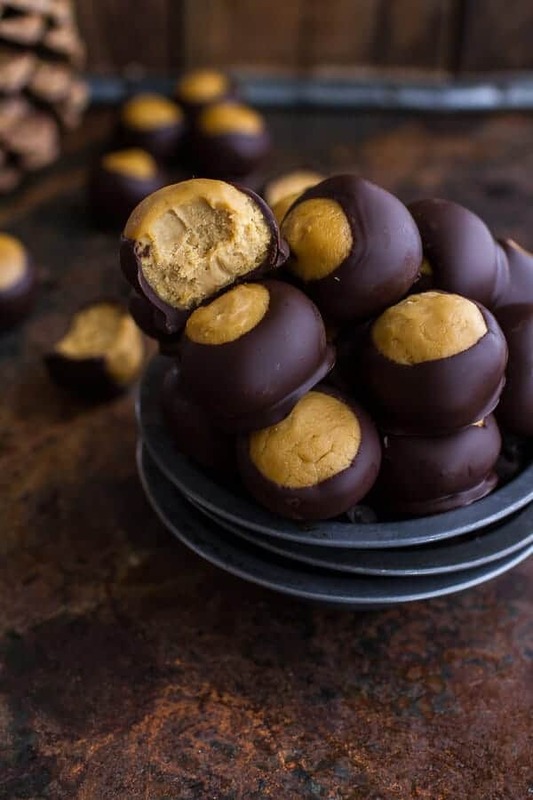 I’ve never had a buckeye, but I will be making these for sure. 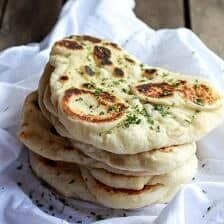 Love all the ingredients in this recipe Tieghan! Thanks Kathy! You have to give buckeyes a try. So good! Can you believe I’ve never made (or eaten) a buckeye before? I have to change that! Hello, genius Tieghan! 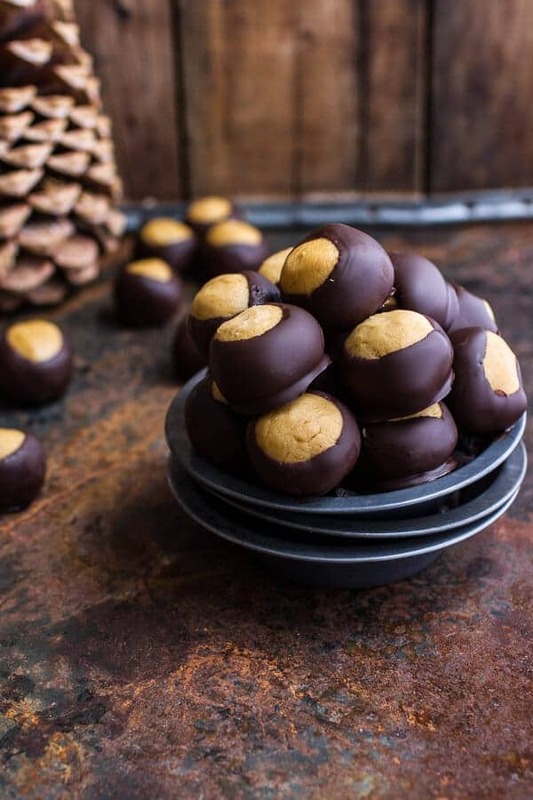 I love buckeyes and now healthier….they don’t stand a chance!! They have been devoured over here! I’m just like Laura, never made or eaten these babies…but this is all gonna change now!! You will love them!! High protein too! 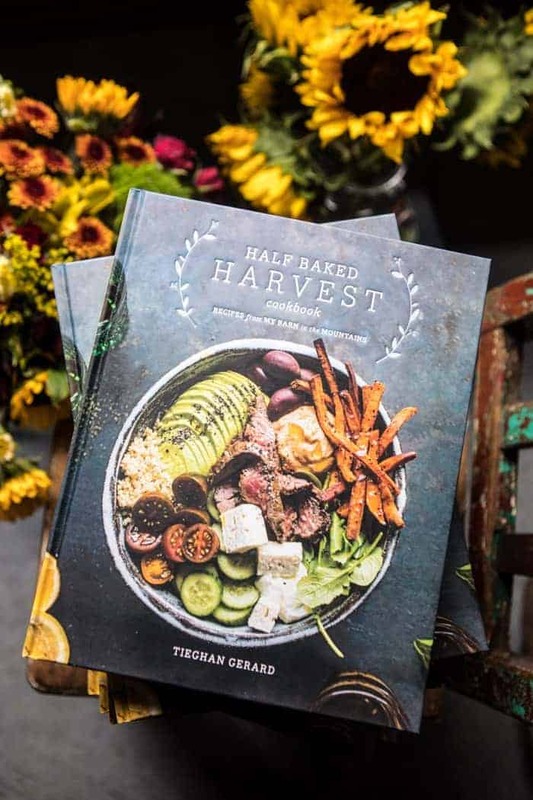 Tieghan, I love how you healthified my favorite treat with sneaky beans (and pumpkin puree = brilliant)! I spent my young-young years in Ohio and am glad I live close enough for weekend jaunts these days. There’s just something about those rolling green hills and gorgeous forests! I agree, it is so pretty!! I had no idea you were from Ohio! 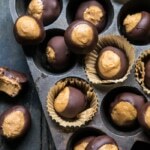 Love the healthy buckeye recipe, on the “to make” list for sure! Fun to learn you’re originally from Ohio and a Browns fan (me too)! Such an interesting version of Buckeyes!!! Can’t wait to try ’em! Congrats on the win Sunday! I too am a Ohio expat… These are just the kinda thing that make me homesick. I’m gonna make ’em ASAP! This is genius! 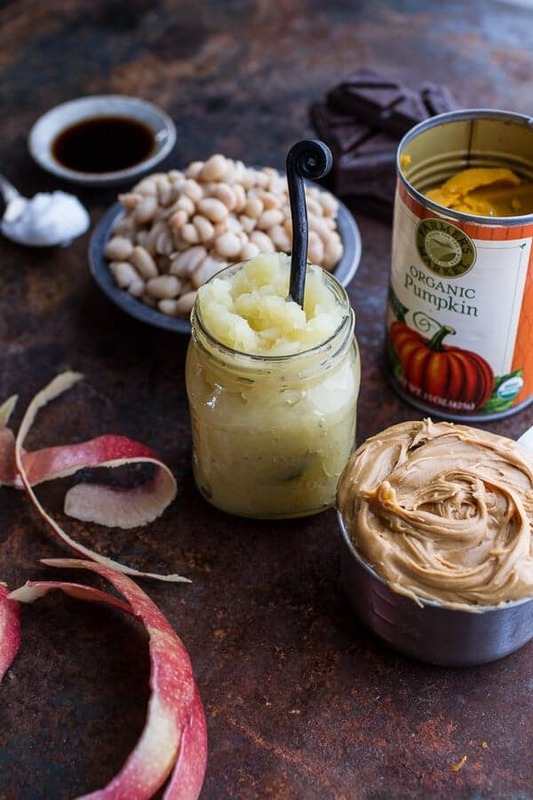 I would never have thought to use pumpkin and applesauce with beans! But I am sure they taste just as yummy as they look! 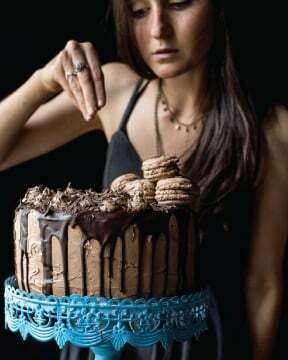 What an awesome way to get your “sugar fix” without having to feel guilty afterwards! Can’t wait to try these out for myself! Green Acres is the Place to Be, Farm Living is the Life for me…or are you to young for @ song? 🙂 Anyhow I feel same way. We’ve managed to “make do” with a mini farm on 6acres but are being surrounded/invaded by subdivisions, would luv to be surrounded by mountains! We are looking into CO but after reading your post other day bout it snowin already…scared me! I’m a southern girl. 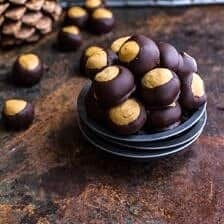 I will be making these Buckeyes today. I have lots of pumpkins in the garden & can’t think of a better use. Girl these look so so delicious!! Now!I want these now! White beans? Pumpkin? I’m diving into these this fall. Can totally relate to the brother test! These look incredible and I can’t believe how healthy you made them – mine are laden with sugar 🙂 Pinned! Thank you so much, Trish!! I was so surprised it work, but everybody loved them!! I put this recipe in the recipe box to try. Tonight though I am making your pulled pork tacos. They look so darn delish!! I have also started some of the Cinnamon Brioche Bread of yours. I sure hope they both turn out and are fabulous!! I will let you know. I am from Ohio, and am acquainted with buckeyes. Delicious. I want to make this version! By the way, I noticed your short title today! “Keep it Simple”, huh? Nothing wrong with that! By the way, I am looking forward to cheesiness tomorrow! 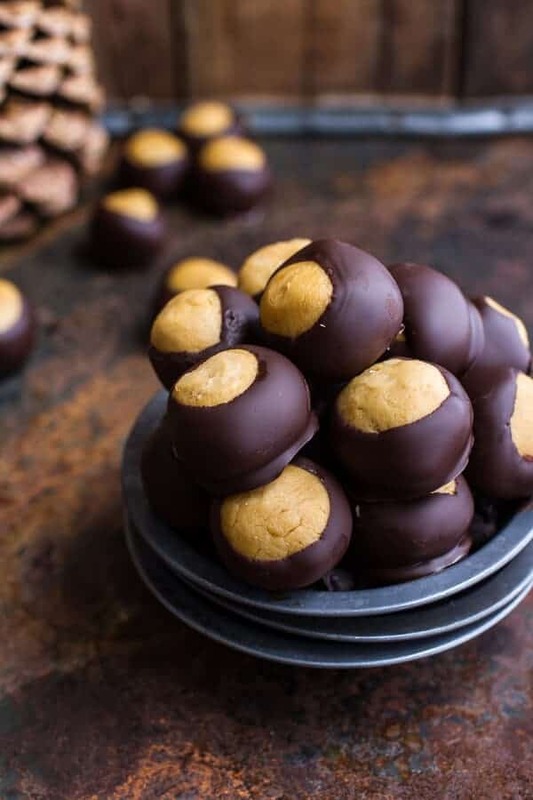 I’ve actually made healthier buckeyes before but these are even better! Never heard of buckeyes before.. they must be native to America as they aren’t common here in Australia. In saying that, I must recreate the recipe.. curious to know what they taste like! You are so smart!! My aunt used to make buckeyes for us at Christmas but I always thought the PB filling was too sweet. These look so good! It is such a sweet filling, I have always reduce the powdered sugar majorly. I couldn’t believe I made them without sugar. They turned out great!! These are flippin’ brilliant! I’m from Ohio and living in Colorado now, too… Glad to know someone else in the state is eagerly spreading the joy that are buckeyes! I love these. I love the sneaky healthy!! They’re perfect! I lived in Ohio too! Buckeyes are one of my favorite treats and these would be perfect for my nephews. Actually, I should have them make me some from your recipe! The look delicious. No way, really? It’s a pretty place to live, but winter are tough! Sounds great! Love that theres no additional wierdo sugar going on! Made these yesterday, sooooo good! I have always wised I could make them healthier and you did it! Will be making again very soon! So excited you loved these! Thanks! These are fantastic!!!! Really! I have been trying cleaner recipes. It can be an acquired taste and / or the recipe can be hit or miss all together. But these… you’ve achieved the ‘wow’ factor; thank you!!!! Hey Lindsay, I am so sorry these came out runny for you. My guess is that it is the canned pumpkin you used. Was it stirable/pourable or thick? I used an organic brand of pumpkin that is very thick and not pourable at all. This helped my dough firm up. If you are using a canned pumpkin that is pourable, you may need to add 1/4 cup to 1/2 cup of white whole wheat or regular flour to help the dough firm up. You will not taste they flour at all. Please let me know if you have any more questions. Hopping the next batch is awesome! Thanks so much! That is a great suggestion. The flavor was obvi still amazing 🙂 so I got some good spoonfuls out of the deal! Obsessed with everything on your blog, thank you! What kind of peanut butter did you use? 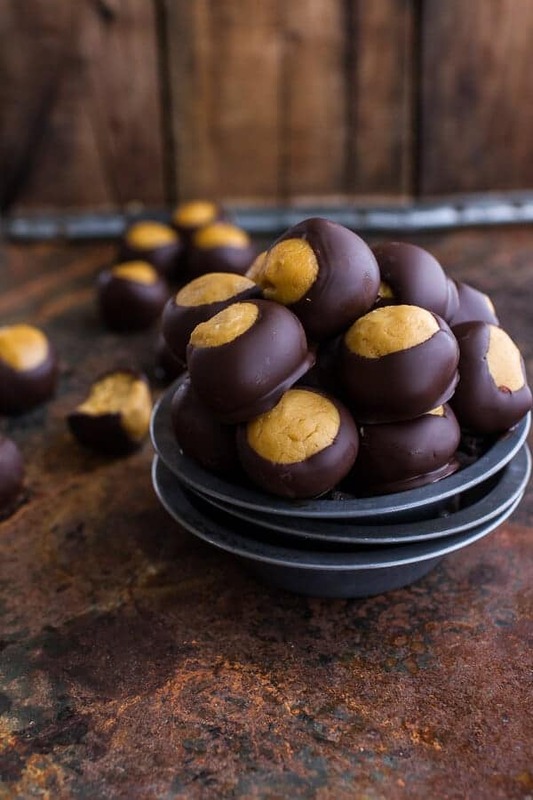 We have been making buckeyes for years, but always use Jif or skippy. Can you make these with a natural peanut butter (one that must be regrigerated)? Wondering about consistency and sweetness. Thanks! I just made these and they are AMAZING!!! they taste so close to the real thing that it’s almost disturbing. in fact they are even better because you can eat a few of them without feeling sick. for other makers: i don’t have a food processor, so i used a combination of potato masher, magic bullet type blender, and immersion blender. instead of the pumpkin i used butternut squash puree which was very solid in the can. the final dough was pretty thin so i added 1/2 cup of flour and refrigerated for 1/2 an hour. then it was thick enough to make into balls, though it was kind of ‘weepy’ [sorry to be gross] so next time i might squeeze the squash out in a cloth to get rid of the extra moisture. but as long as you keep them chilled the extra moisture stays solid and you’re good to go. thank you so much for the recipe!! can I use white kidney beans instead or will they not provide the right taste/ consistency? I ended up following the recipe exactly and using cannellini beans. For some reason though it turned out so soupy even with a very thick pumpkin puree. I ended up having to add over a cup of GF flour and some powdered stevia to try and thicken it up. After that I even had to let the dough sit over night before rolling it into balls. I must say that they did turn out absolutely delicious and they were a huge hit!!! After reading some other comments though it seems as that for some reason the recipe can end up too runny. Okay, I’m convinced I need to make these…like right now! The problem is, I don’t have any cannelini beans on hand—do you think I could sub in chickpeas? Thanks for the super awesome recipe Tieghan! I can’t wait to try it out. We tried these buckeyes and got mixed reviews from the family. The general consensus was that they are alright. We could definitely tell a difference from original buckeyes. So sorry they turned out to be not what you thought. I really appreciate that you made this recipe using beans and no butter! Especially as a vegetarian, I’m excited to know these will be little protein packed power snacks. Thanks for an awesome recipe! Also – I’m in LOVE with your photography. It’s insanely good. Brava, girl! Like Jillian P I also had to add more peanut butter so they tasted peanut buttery…but like, a lot more. I think I used about 12-15 oz of PB total! All my ingredients were from Kroger, not sure if their PB is just not very PB-y? Hmm, I don’t know. So happy you enjoyed these! THANKS! I made these tonight for a Halloween party on Friday. Trying something new because a GF friend will be here. This is my first experience making buckeyes. Haven’t tasted the finished ones yet. The filling is good although I did add two heaping tablespoons of PB because they didn’t taste peanut butter-y enough to me. Wondering what the point of the coconut oil is. Could we have just left it out? Will comment back after we’ve tasted the finished ones and the party reviews. Thanks! I’m totally intrigued by these! I have two questions – 1) Do you think they would freeze ok? Making my Christmas cookies now, so wanting to make sure these would hold up. And, 2) I know this would be breaking the Buckeye traditions, but do you think texture wise it would work to make these as bars? Like “Buckeye Bark” that I’ve found elsewhere on Pinterest. Thanks for the healthful recipe! I look forward to giving it a try! So I am not sure how these freeze. It might work, but it might also affect the texture. I wish I could say for sure, but I have never tried it. 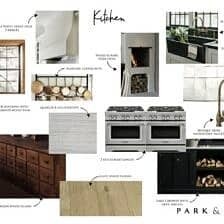 I do think bars/bark would be amazing! Let me know if you have any other questions. Thanks! So excited to try these! I’m from Kentucky and we were just close enough to Cincinnati to have these as a holiday staple! Was wondering if there is a good substitute for the coconut oil, or if it can be omitted? I’m allergic to coconut and unfortunately find that so many recipes just don’t work without it! Hi there! 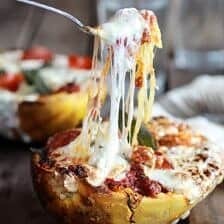 Just stumbled across the recipe and was super excited to make them last night! After I blended everything together, the flavor was great but the texture was way too thin to roll into a ball. I ended up having to add oats to make it “doughy” enough to roll. Any suggestions for next time on how to get it more doughy without adding oats?? I am super happy that turned out awesome Amber! Thanks so much! I’m a little confused–do you mean 1 oz of canned cannellini beans or 1 14-oz can of cannellini beans? I’m attempting to make these right now but the consistancy of the peanut butter filling is more like frosting. I did everythign according to the recipe (ie drained the can of beans etc). What can I do to make it firm enough to roll into balls? I’m trying to get it to firm up in the fridge right now but I doubt it will make that much of a difference. Hi! I would start plopping tablespoon size spoonfuls onto a parchment lined baking sheet, then freeze for 20 minutes and then roll into balls and freeze again. this should work great! Please let me know if you have any other questions. I hope you love this recipe. Thank you!